Contrary to popular belief - Apples get Viruses and Worms too! This Antivirus doesn't slow down your MAC! ESET Cybersecurity is designed to be smart and clean, just like your Mac. Powered by the advanced ThreatSense® scanning engine, ESET Cybersecurity for MAC features proactive protection, an intuitive user interface, and solutions that run seamlessly in the background. MAC computers are gaining market share. As the MAC platform gains market share it gets the attention of cybercriminals who are writing malicious code. EVERY day new Malware comes out that affects the MAC so it is simply a matter of time before your MAC gets infected – that is, if it operates WITHOUT protection. 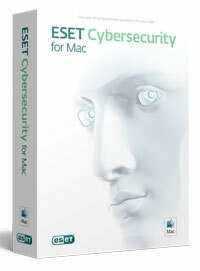 ESET Cybersecurity for MAC has the smallest footprint and fastest MAC Antivirus Scanner available. This powerful combination of ESET technology, Mac OS X, and the complimentary online training (once you purchase a ESET Cybersecurity for MAC license), keeps you safer against cybercriminals. Learn more from the consumer brochure. Blocks any attempts to infect your Mac or steal your personal information. Eliminates threats to your Mac from email and removable media, such as USB, FireWire, CDs, and DVDs. When sharing music, video, or other files, it's possible that these files contain viruses that may not be a threat to the Mac, but should be cleaned to protect your friends, family and others who may receive files from you. ESET Cybersecurity eliminates Windows, Linux and OS X malware in real-time.